The AFL has released the women's draw for next month's International Cup. There will be a total of seven women's teams competing for the title this year. The USAFL will be sending two teams, the Freedom and Liberty. The Freedom will take on Canada Northern Lights in the opening round followed by Canada Midnight Suns, Tonga and Fiji. The Liberty will play Canada Northern Lights in the second round then Ireland, Fiji and Canada Midnight Suns. We are excited to announce the Freedom/Liberty fundraising website is up and running! As you know, the USAFL is a non-profit organization, and most of the efforts to represent the US in Melbourne at the AFL International Cup is self-funded by the individual players. This year, we chose to send two women's teams to Australia because we believe in not only representing the US to our fullest, but also to support the growth and development of the game of footy around the United States. The USAFL is pleased to announce a sponsorship agreement has been reached with Impact Mouthguards. As part of the deal, USAFL players will receive a 10% discount on all mouthguards ordered. In addition to supporting the league Impact will also provide mouthguards to the Revolution and Freedom as they represent the league and country at this year’s International Cup. The members of the USA Freedom are selling scarves as part of their fundraising efforts to get both women’s teams, the Freedom and the Liberty, to the 2014 International Cup in Melbourne, Australia. Each individual scarf is $25, and 100% of the proceeds go towards the team. Help support the Freedom by ordering your scarf today! For all orders, click on the link below or email womens@usafl.com with your information. Go Team USA! Watch Footy - Support Team USA! The USAFL is pleased to announce a subscription rebate program through Watch AFL TV. For every subscription made through THIS LINK, or by clicking on an associated banner ad on usafl.com, 5% of the subscription total will be returned to the USAFL. All money raised via this rebate program before June 30, 2014, will go directly towards your USA National Teams to help cover their costs at the 2014 AFL International Cup in Melbourne this August. Read more about Watch Footy - Support Team USA! The USAFL is very excited to announce the Freedom and Liberty squads that will be making their way to Melbourne, Australia this August. The Freedom squad is made up of 28 ladies that will be playing in the AFL International Cup. The Liberty includes 22 players set to compete against regional Melbourne teams including the Bendigo Thunder and the St. Albans Spurs. 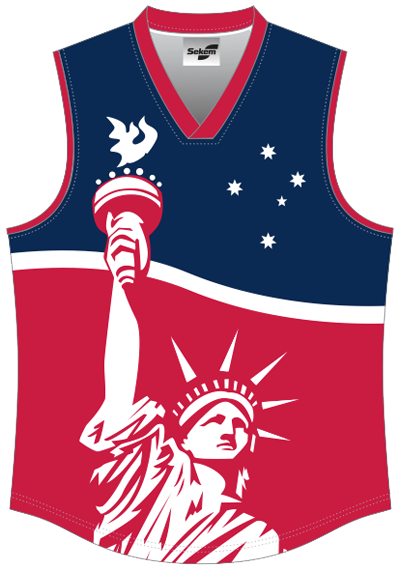 This weekend, February 21-23, the women of the United States Australian Football League (USAFL) will descend upon Houston, Texas for the 2014 USA Freedom Training Camp. More than 60 players and staff will be attending the event, which will be held at the Cullen Park Soccer Fields on the outskirts of Houston. Any women interested in participating in the USA Freedom program and trying out for the 2014 International Cup squad are invited to attend this open information session.